November 2011 Nissan sales, are in and although up versus October 2010, Nissan GT-R sales are still pretty slow with 56 cars sold. In 2010 there were 50 cars sold for November 2010. Total for 2011 to date is 1259 GT-R's to 839 in 2010. 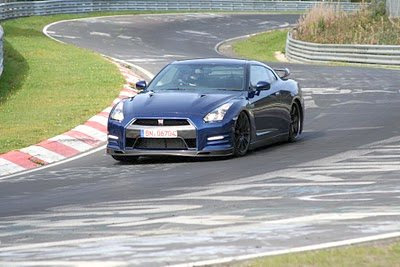 The rumors and information on the 2013 Nissan GT-R, along with low supplies probably affected the total sales. Expect a bit more of a bump for the 2013 car early next year. Sales on the 370Z are still slow with 356 cars in October 2011 and 6879 cars to date. The LEAF, Nissans all electric car sold 672 units with a year to date total of 8720. Nissan's press release below. Nissan North America, Inc. (NNA) today reported record November U.S. sales of 85,182 units versus 71,366 units a year earlier, an increase of 19.4 percent. Nissan Division sales also set a new November record, increasing 21.5 percent for the month to 76,754 units. Sales of Infiniti vehicles increased 3 percent from the prior year, to 8,428 units. Nissan vehicles posted record November sales with 76,754 units, an increase of 21.5 percent over the 63,184 units sold in November 2010. Versa – led by brisk demand for the all-new 2012 Versa Sedan – set a new November record with 9,291 deliveries, an increase of 38.2 percent over the prior year. The Rogue crossover also delivered a November record with sales of 10,845 units marking a 27.2 percent increase over last year. The Nissan Altima maintains its place among the industry’s leading passenger cars, with 20,613 units marking an increase of 12.2 percent over the prior year and a new November record. Nissan’s lineup of trucks, SUVs and crossovers all showed gains over last November, led by the Frontier pickup (up 37.8 percent) and Pathfinder (up 26.3 percent). Sales of the 100-percent electric Nissan LEAF totaled 672 units in November, with deliveries totaling 8,738 units of the innovative, zero-emission vehicle since its December 2010 U.S. debut. Nissan Commercial Vehicles continues to build awareness for the 2012 Nissan NV commercial van, resulting in 1,238 deliveries, its best month since its Spring 2011 launch. Infiniti sales totaled 8,428 units for November, an increase of 3 percent versus 8,182 a year earlier. Infiniti QX sales of 1,446 was an increase of 9.0 percent for the month, the best November in the full-size luxury SUV's history. With sales of 3,623, the Infiniti G Sedan had an increase of 26.9 percent for the month, its best November since 2007. The updated 2012 Infiniti FX saw an increase of 24.9 percent, the best November for the luxury performance crossover since 2007. NOTE: To ensure consistency in global sales reporting, Nissan North America calculates monthly variances on a straight-percentage basis, unadjusted for the number of selling days. November 2011 had 25 selling days, while November 2010 had 24 selling days. Nissan Motor Co., Ltd., Japan's second-largest automotive company, is headquartered in Yokohama, Japan, and is part of the Renault-Nissan Alliance. Operating with more than 248,000 employees globally, Nissan provided customers with more than 4.1 million vehicles in 2010, generating revenue of 8.77 trillion yen ($102.37 billion U.S.). With a strong commitment to developing exciting and innovative products for all, Nissan delivers a comprehensive range of 64 models under the Nissan and Infiniti brands. A pioneer in zero-emission mobility, Nissan made history with the introduction of the Nissan LEAF, the first affordable, mass-market, pure-electric vehicle and winner of numerous international accolades, including the prestigious 2011 European Car of the Year award and 2011 World Car of the Year.